My new favorite stop for a really great piece of meat is Rainshadow Meats in the Melrose Market on Capitol Hill. I told Chris I have a little man meat crush. Whenever I go there, I try to play it cool, but really, what I want to do is pull up a chair and just hang out and watch the goin's ons all day. It's the Chanel of butchered meats, but much more accessible. I stopped in today for a roast of some sort for tonight's dinner and came away with this beautiful leg of lamb roast. 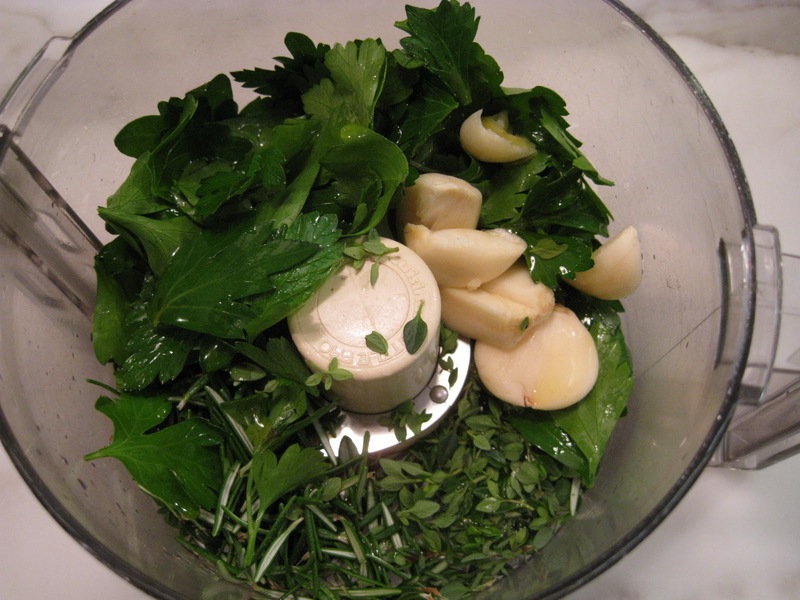 In a food processor with a metal blade, chop rosemary, thyme, parsley and garlic with 1 tsp olive oil. Scrape down the side of the bowl with a rubber spatula and process until herbs are all finely chopped. Combine the herbs with the bread crumbs, parmesan, and 1 Tbsp olive oil. Cover, set aside until ready to use. Salt and pepper the lamb and rub it with 1 Tbsp of olive oil. Using a large cast iron pan, sear the lamb on all sides, about 2 minutes per side. Make sure your pan is very hot before starting. Place seared lamb on a roasting rack set inside rimmed pan. Roast in the oven for about 30 minutes, or until the lamb measure 120 in the thickest part of the lamb. Remove the lamb, cut and discard the string. Brush the lamb with the dijon mustard. Press the herb bread crumb mixture onto the lamb. Return the lamb to the oven and roast for another 15-20 minutes or until the lamb measures about 135 degrees for medium rare. Remove lamb and let rest for about 10 minutes before slicing. It was a beautiful thing. AMAZING. Thank you a million.